In the UK, people used to have parties on Twelfth Night and it was traditional to play practical jokes on your friends and neighbours. These included tricks such as hiding live birds in an empty pie case, so that they flew away when your startled guests cut open the crusts (as in the nursery rhyme "Sing A Song of Sixpence" goes, "…the pie was opened and the birds began to sing". The Twelfth Night cake was a rich and dense fruitcake which traditionally contained a bean. If you got the bean then you were King or Queen of the Bean and everyone had to do what you told them to do. Twelfth Night itself was a traditional day for plays or "mumming" and it is thought that Shakespeare's play, Twelfth night, took its name from the fact that it was first performed as part of Twelfth Night celebrations about 1601. A traditional Twelfth Night drink is a hot and spicy punch called wassail. People in the UK still celebrate Twelfth Night today. Many places throughout the UK carry out the Twelfth Night tradition called "Wassailing." On Twelfth Night a lot of people gather to drink to apple trees and to each others health. Each year Twelfth Night is celebrated on London's bankside riverside. 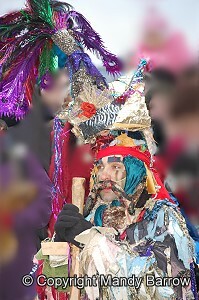 To announce the celebration, the Holly Man appears from the River Thames. 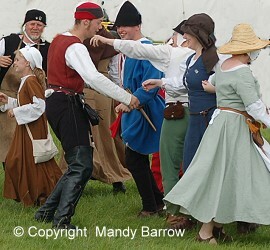 Afterwards the traditional St. George play is performed. At the end of the play Twelfth Night Cakes are distributed. Those who find the hidden bean or pea are crowned King and Queen for the day.